Apples, in my opinion are the perfect autumn cake accompaniment. 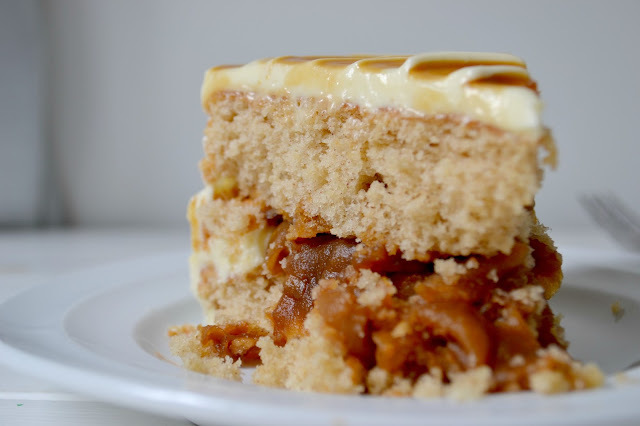 With windfalls happening often, baking is a great excuse to brave the change in weather, go picking and treat yourself to something warm and comforting. 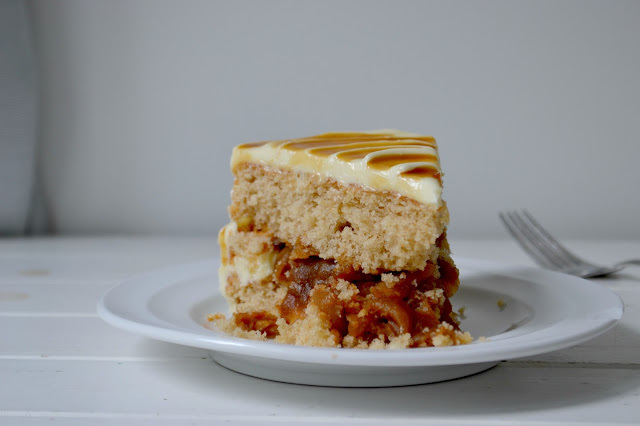 A delicate cinnamon, spiced cake with a soft apple filling, it’s an impeccable start to the autumn season. 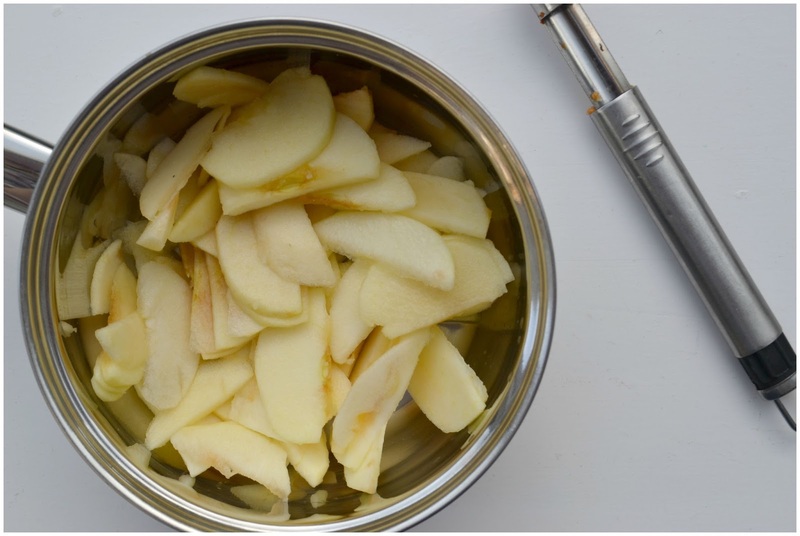 Peel and core your apples before finely chopping them up into small slices. Add the apples, sugar and cinnamon to a pan and cook over a medium heat until soft. Strain the apples from the juice and allow both to cool. Preheat oven to 350F, 180C or Gas Mark 4. Prepare two 8 inch cake pans with parchment paper on the bottom and sides. This cake can have a tendency to stick to the bottom of the pan, so I strongly recommend the parchment paper on the bottom. Cream the butter and sugar together until pale. Add the eggs one at a time, not adding the next until the yolk of the first has disappeared. Combine the flour, cinnamon and baking powder together, sift through and set to one side. Add half the flour and milk, mix until just combined. Add the rest and mix until just combined. Do not over mix. Scrape down the sides of the bowl as needed to make sure everything is well combined. Divide the batter evenly between the prepared cake pans and bake for 20-25 minutes on a middle shelf until golden on top, or until a cake tester comes out clear. Remove the cakes from oven, while still warm poke some holes (using a fork) in the top and generously brush or spoon over the cooled apple syrup. Allow the cakes to cool for 5 minutes in the pans, remove to a wire rack to finish cooling completely. Add the double cream and icing sugar to a large mixer bowl and whip on high speed until soft peaks form. Add the mascarpone cheese to the whipped cream and whip until stiff peaks form. It will happen fairly quickly. Set whipped frosting in the refrigerator until needed. 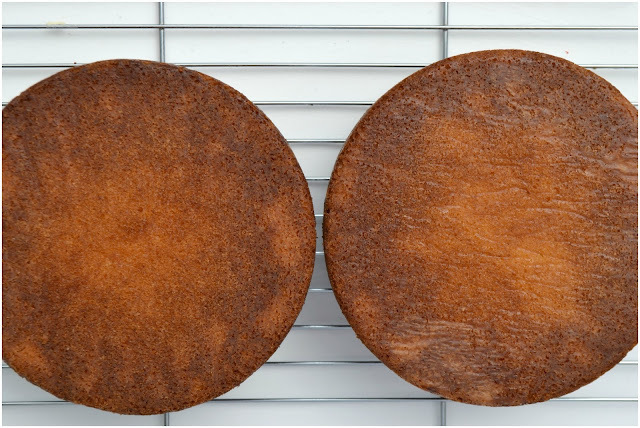 When the cake layers are cold, place the first layer upside down on a serving plate or cardboard cake round. 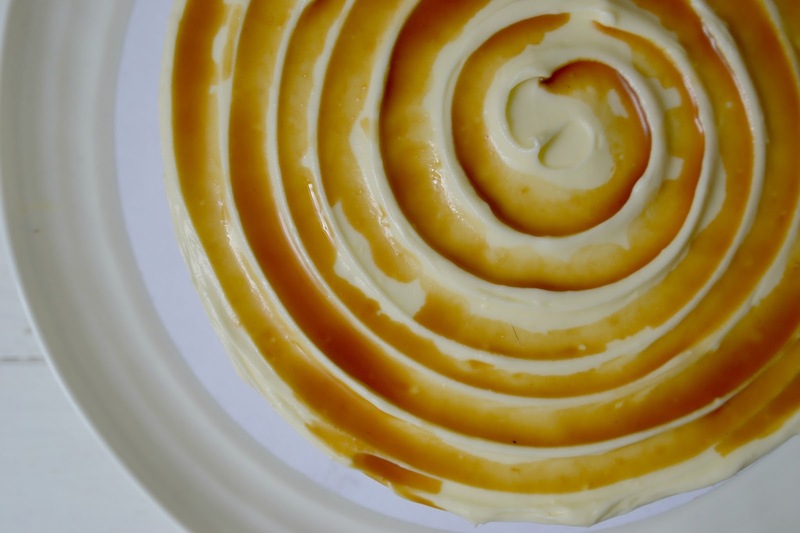 If your cake has a slight dome in it, use a serrated knife to level it off as best you can before you start frosting. Using a disposable piping bag, fill it with some frosting and pipe a little wall of frosting around the outside edge of the cake. 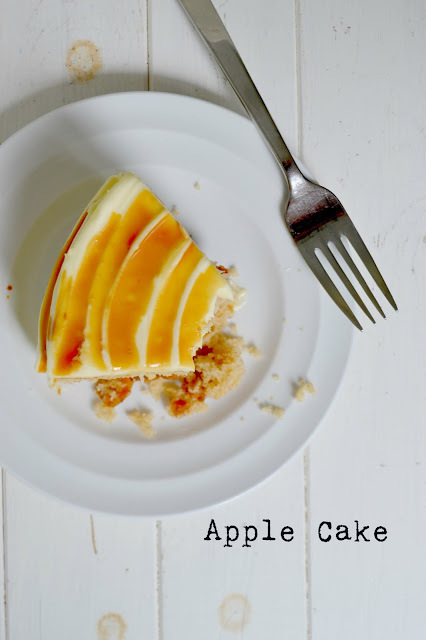 Spread some of the cold apple filling evenly on top of the cake layer, inside the frosting wall. 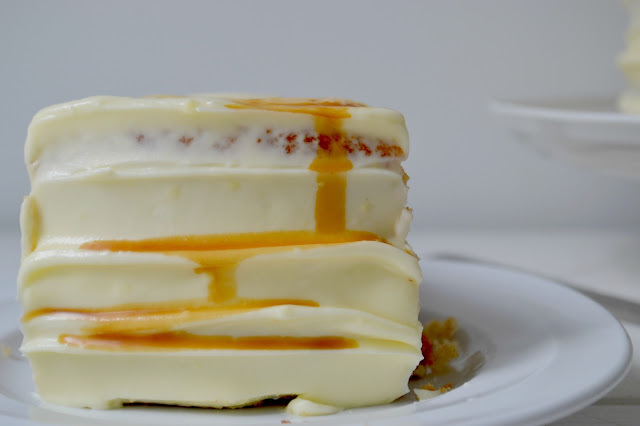 Add the second layer of cake in the same way, smoothing out the frosting on the sides. Use some left-over frosting to cover and fill the cake, then smooth out the frosting around the sides and top of the cake using an offset spatula. 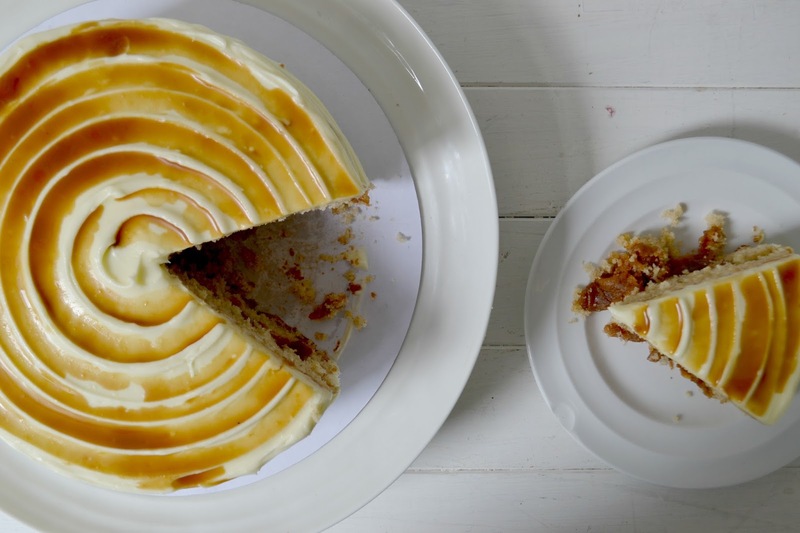 Finish off the cake with swirls of frosting and leftover apple syrup. Refrigerate the cake until ready to serve. Wasn't that easy? And genuinely a yummy, warm way to bring in the Autumn season to your home. Happy Autumn Baking! Your apple cake looks seriously good. The swirl on the second picture made me go "oooooooooh!" out loud, haha!